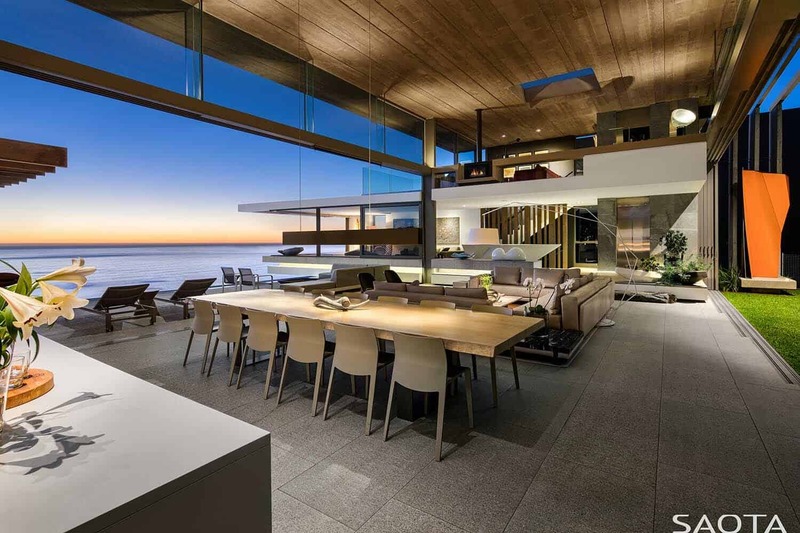 This modern home creates a beautiful setting for life and art, designed by SAOTA Architecture and Design, located in Clifton, a suburb of Cape Town, South Africa. 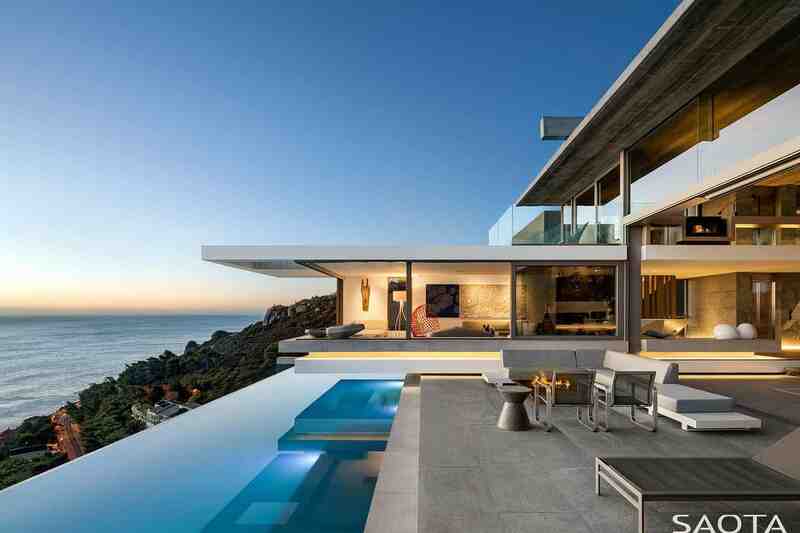 The design of this residence is inspired by its dramatic setting, perched on the shoulders of Lion’s Head. This steep hillside drops off to Clifton’s four dazzlingly white sandy beaches and beyond to the Twelve Apostles. 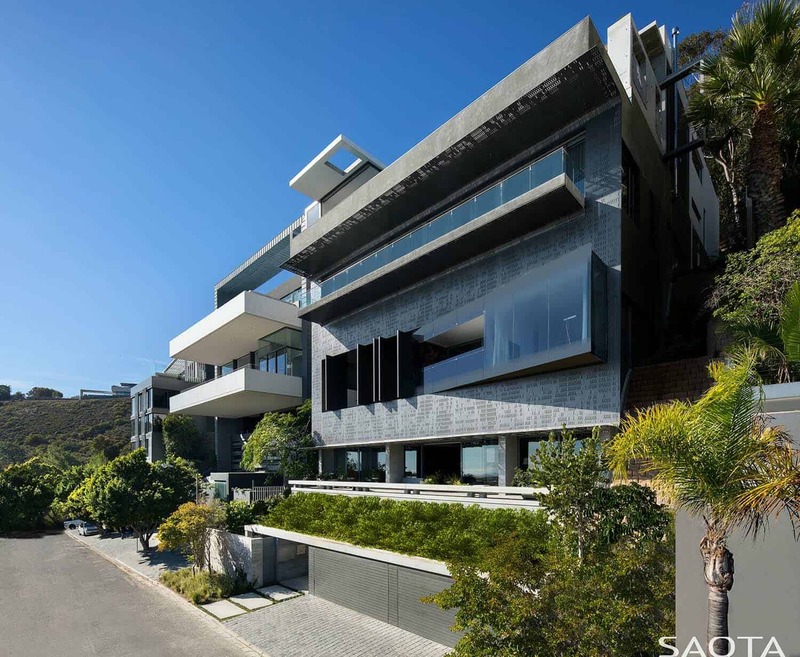 Entry into this home accessed just off Nettleton Road, which is the most sought-after street in South Africa. 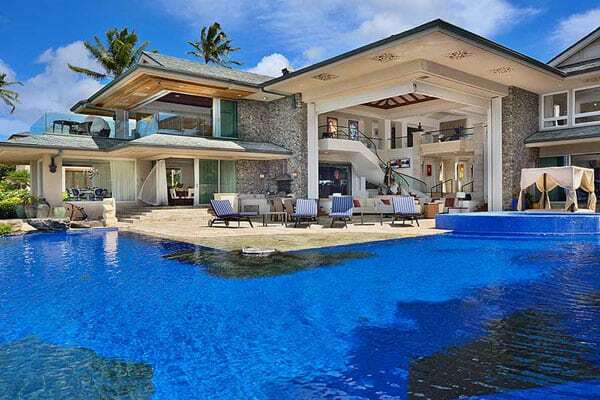 There are two levels above the swimming pool deck and four levels below. 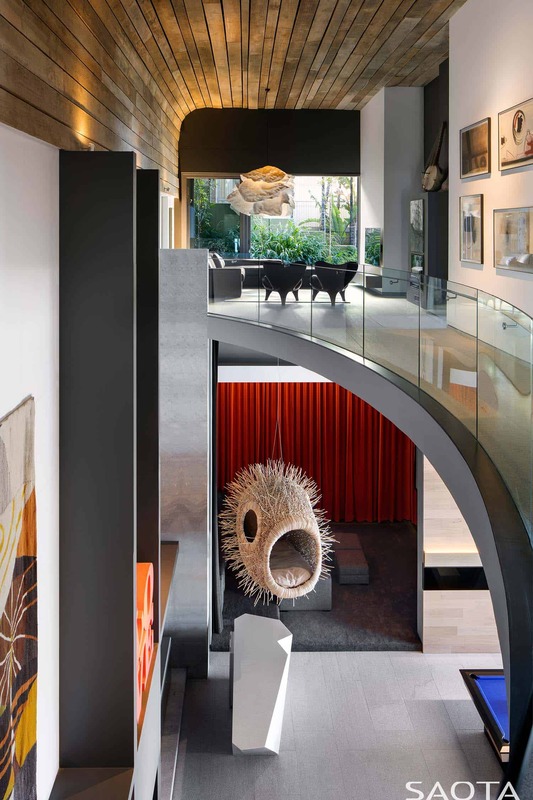 On the interior, a carefully considered collection of contemporary South African art is a highlight of this fascinating home. 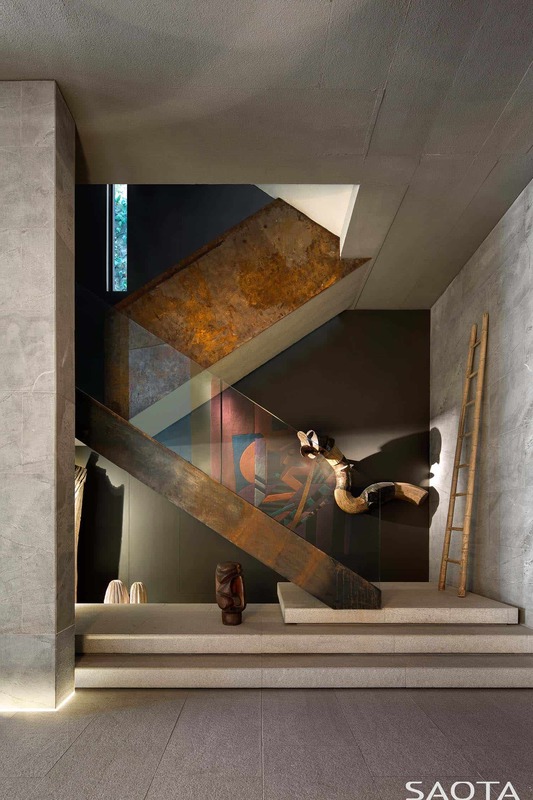 Above: Double volume entrance foyer with a rusted steel and glass staircase. “Three Blind Mice” by Kevin Brand is on the staircase wall and on the landing ledge is a totem by David Brown. The steel wall sculpture off to the right is by Paul Edmunds. What We Love: This striking hillside home features expansive walls of windows that peel back to blur the lines between indoors and out. 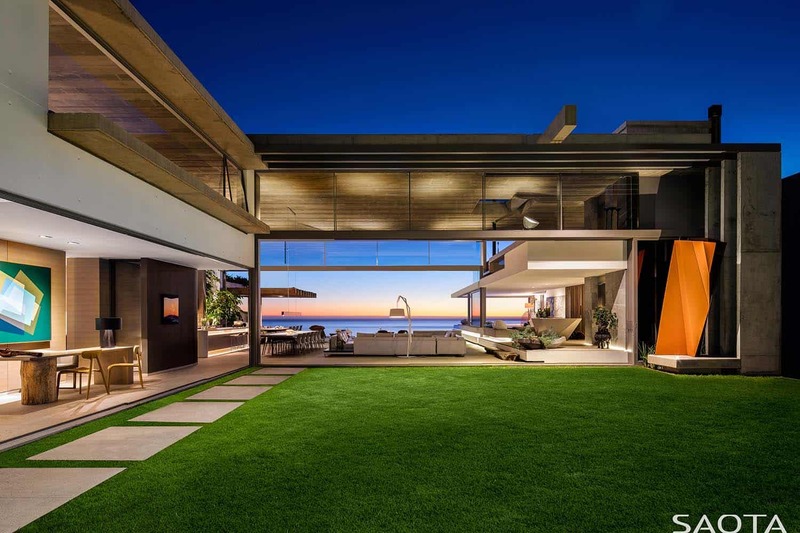 This helps to create a visually continuous transparent space that links the lush garden at the back of the property to Table Mountain National Park and to the infinity pool — appearing to stretch out into the seaside. 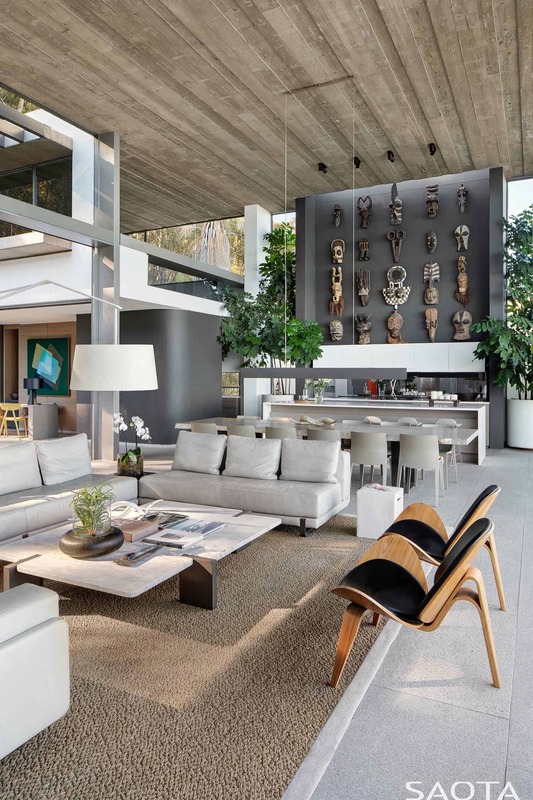 On the interior, the fascinating collection of South African art steals the show, as does the voluminous ceilings and spectacular views… Readers, please share with us what details in those home most appeal to you. 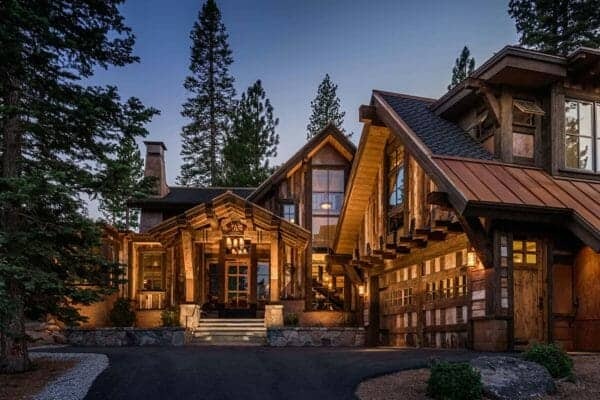 Is this your idea of a dream home? Tell us in the Comments! 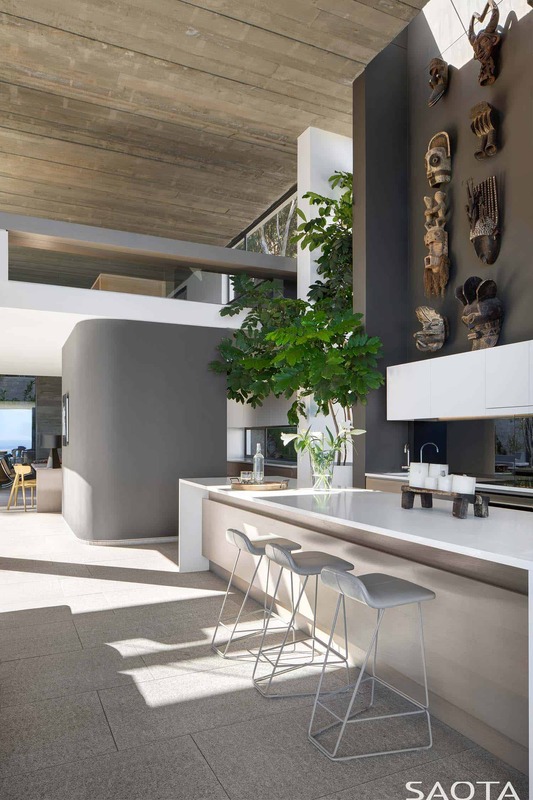 Note: Have a look at a couple of our most popular home tours that we have featured here on One Kindesign from the portfolio of SAOTA Architects: Contemporary family dwelling nestled on the Sydney Harbour shore and Spectacular modern dream home on the island of Ibiza. Above: The kitchen, dining room lounge and bar lounge are situated on the fourth floor. 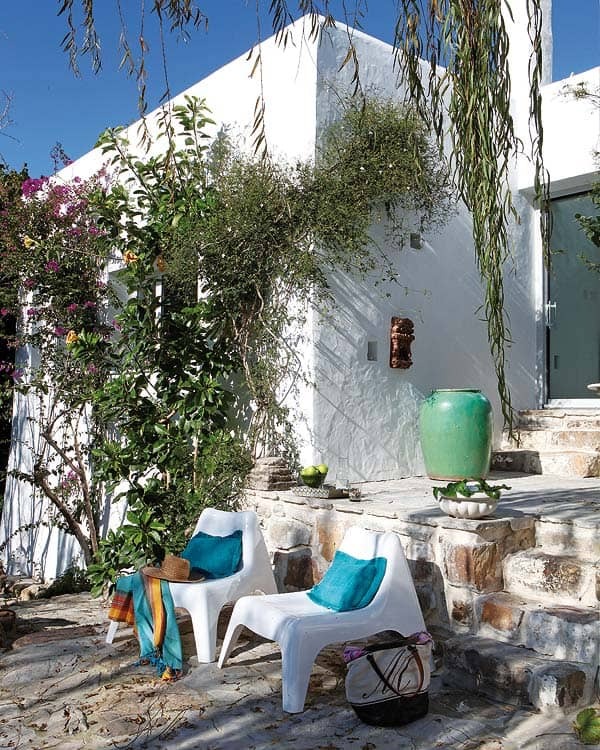 The courtyard garden is on the mountain side facing Lions Head with distant views of the Atlantic Ocean. Above: The family room on the far left with double volume tapestry is the by Keiskama Trust. 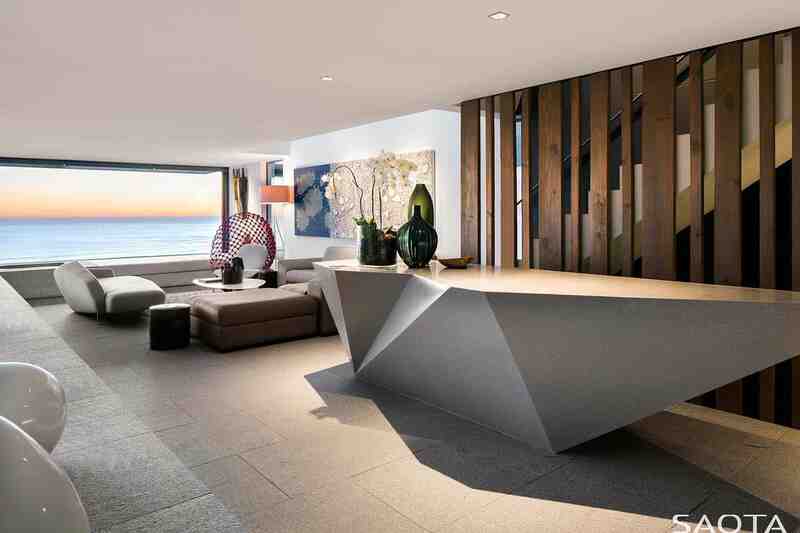 Reading table next to the family room incorporates Andrzej Urbanski landscape artwork behind it and the artwork adjacent is Nzuri Fufu by Cyrus Kabiru. The mask wall in the kitchen is a collection of Central and West African masks. 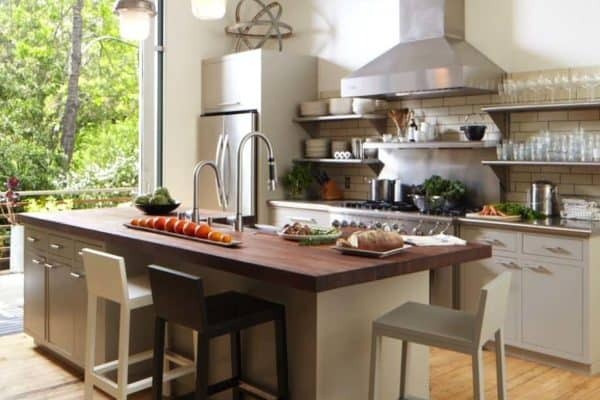 The kitchen, dining room and lounge are in the center and the De Riguour standing lamp and Jada couches are by OKHA. The outdoor dining pavilion on the right showcases panoramic views of the Atlantic Ocean. Above: The French oak dining table is by Pierre Cronje with Arper Juno chairs. The study and winter lounge can be seen on the upper mezzanine level. Above: The living level at the front of the house integrates the kitchen and dining room areas. 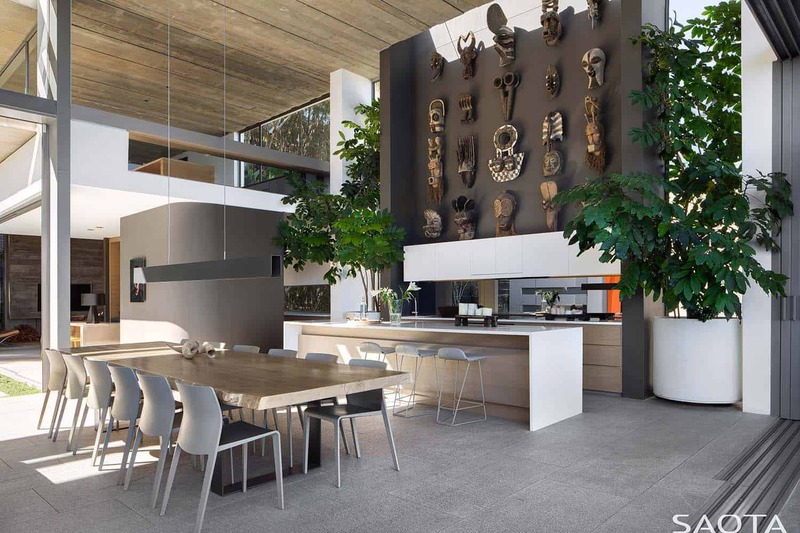 The French oak dining table is by Pierre Cronje and Etch Bar stools are by OKHA. The mask wall features a collection of Central and West African masks. The lower levels boast six generous-sized bedrooms, three of which can be interlinked for a family suite. A double volume entertainment space boasts a spa, games room and home theater. 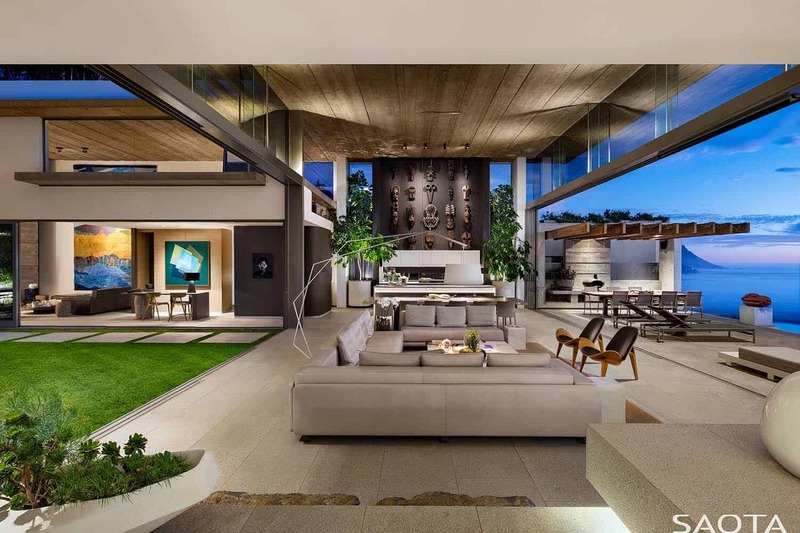 The main living zones can be found in the upper level of this residence, featuring an open and spacious double-volume. This space encompasses the kitchen, bar, dining, living and family rooms as well as a winter lounge, study and art studio at a mezzanine level. Above: The lounge living area features the Jade couch by OKHA and Shell chairs by Hans Wegner. 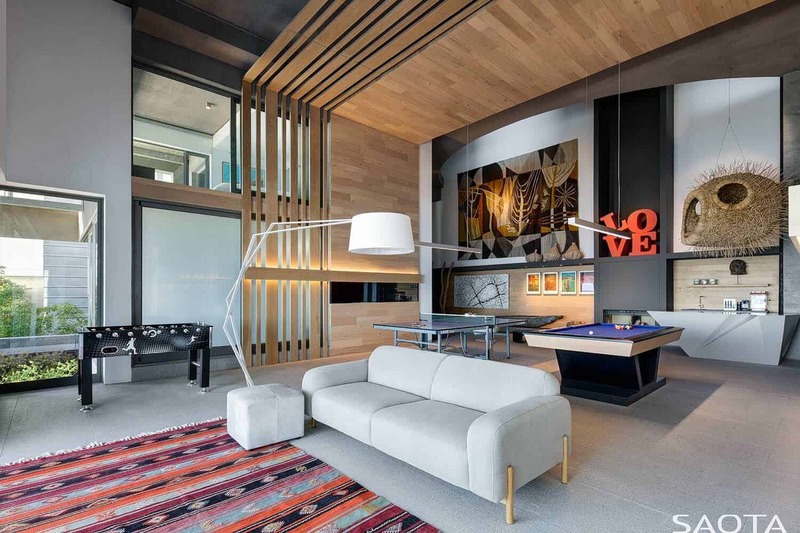 Above: The bar and bar lounge is suspended over the pool and incorporates the Curator couch by OKHA, Dragnet lounge chair by Kenneth Cobonpue and artwork by Martie Kossatz. 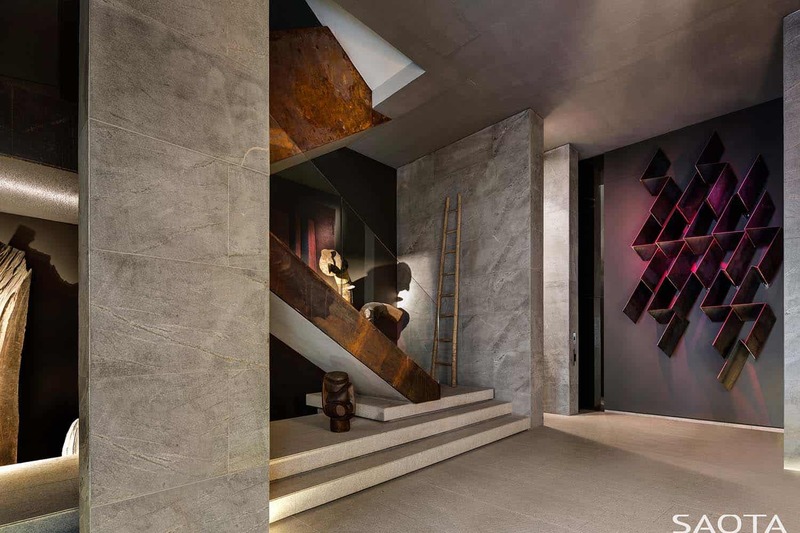 Above: The gallery foyer is situated on the bedroom level with pyjama lounge at the end. The cinema and games room are on the lower level and can be seen from the gallery. Showcased along the gallery wall is a collection of artwork by Charles Gassner, Mother and Child by Walter Battiss and A019 by Andrzej Urbanski. 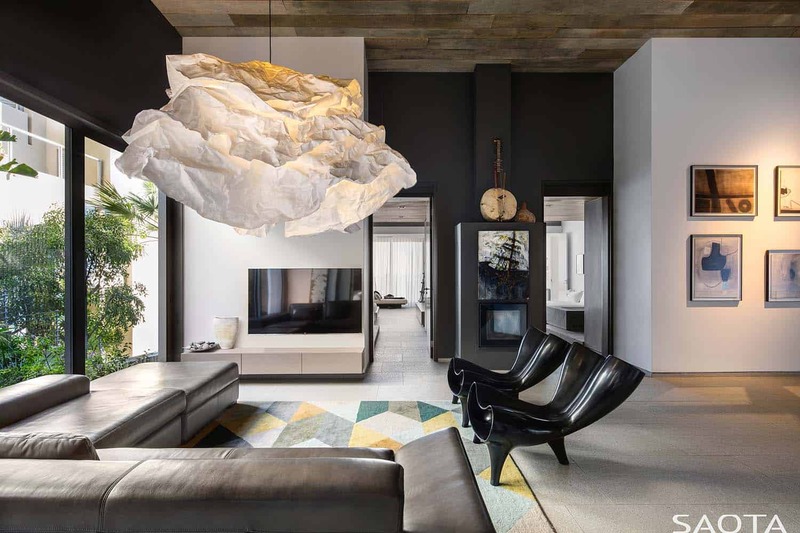 The Nicci chair is by OKHA and the ‘Blowfish’ by Porky Hefer is hanging in the double volume space. Above: In the pyjama lounge there are two Orgone chairs by Marc Newson that sit below the Cloud Lamp by Margie Teeuwen. A collection of artwork by Charles Gassner. 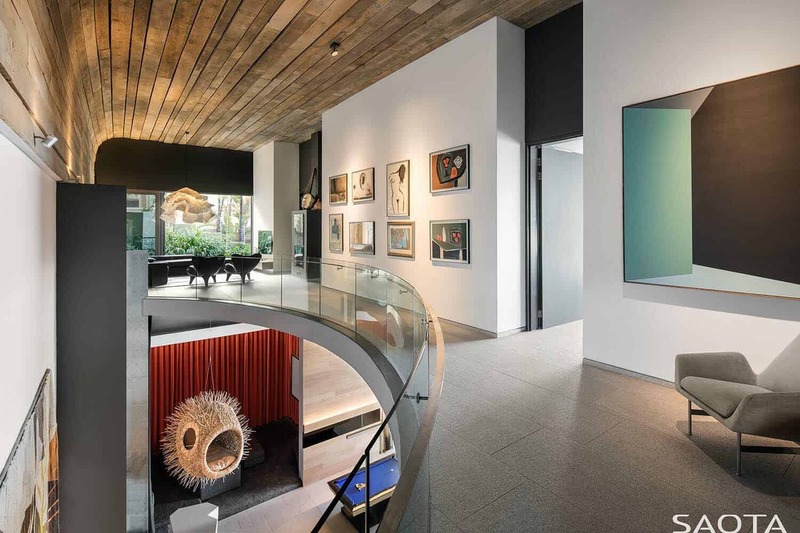 Above: In the cinema and games room, the Blowfish by Porky Hefer is hanging in the double volume space. The STM chair and Barbuja coffee tables are by OKHA and are strategically placed next to the fireplace. The Central African Makoro Dugout boat and African baskets sit below a Cecil Skotnes tapestry. Above: A Greek traditional rug in the games room. 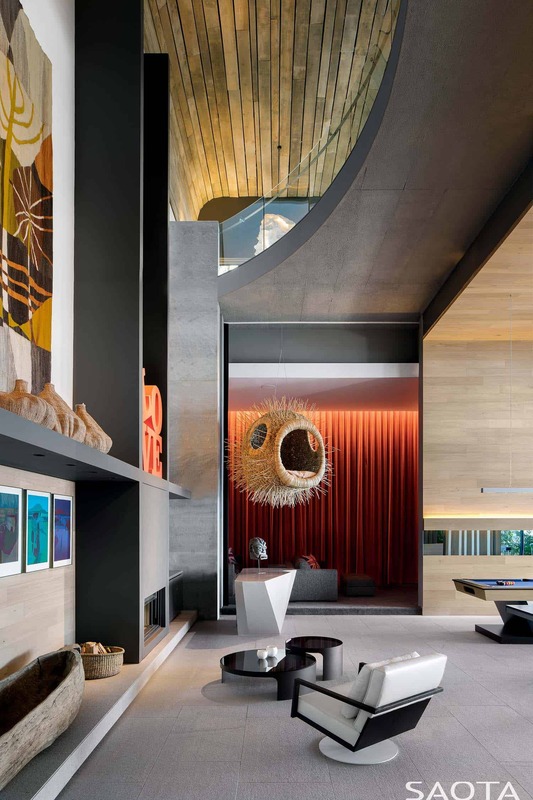 Tapestry from the President Hotel 1967 in Johannesburg by Cecil Skotnes and Blowfish by Porky Hefer hang in the double volume space. 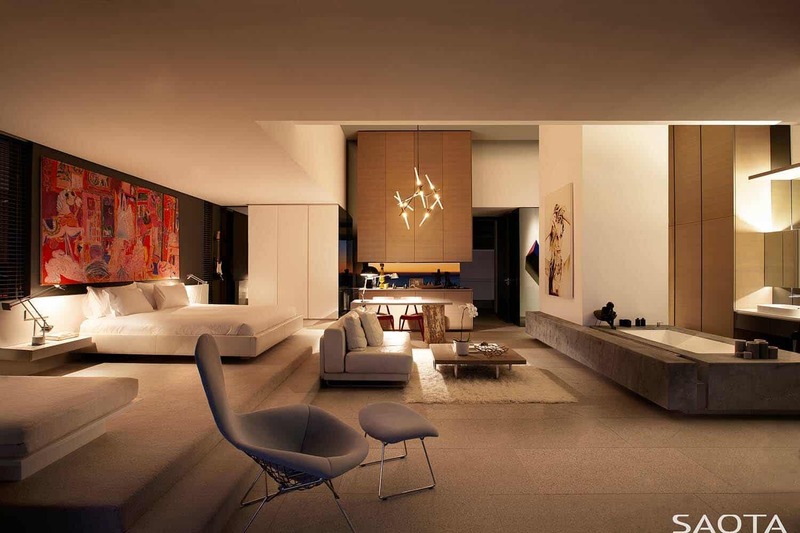 Above: The main bedroom incorporates a Bird chair by Harry Bertoia and Jada couch by OKHA, over the Flokati rug. Carnival artwork by Yvon van der Heul. 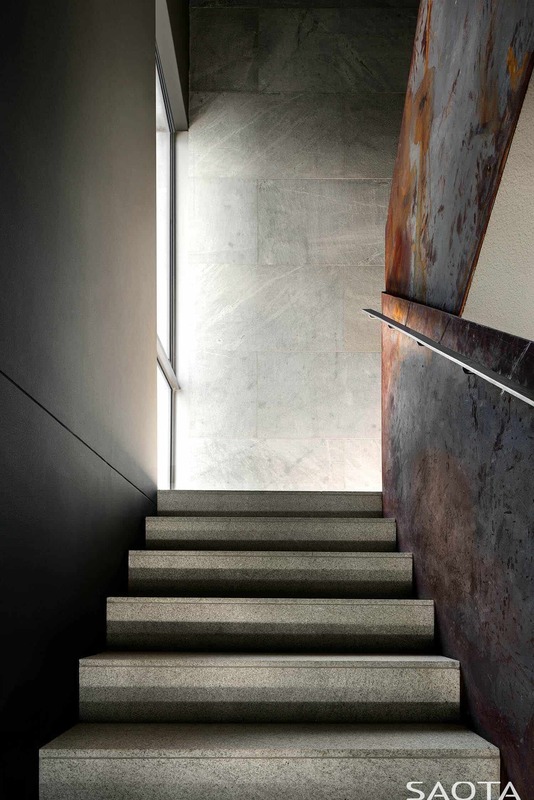 Above: The staircase consists of light gray granite stair tiles with crude steel side balustrade sheets that have been left to rust naturally. The walls are matte silver-gray granite. Above: The finely perforated aluminum screen is folded at the bottom and upper levels. A slot has been cut out of the center to allow for views from the games and spa areas. The curtain glass guest bedroom slides and cantilevers out. The entrance is on the ground level. “The entrance facade responds to Le Corbusier’s definition of architecture as a “magnificent play of masses brought together in light” – and the journey through space and light that follows is clearly inspired by the Modernist movement,” explains the architects. One Kindesign has received this project from our submissions page. If you have a project you would like to submit, please visit our submit your work page for consideration!